In school districts without air conditioning, a 1℉ increase in average school year temperature is associated with a 1 percent decline in learning. Cumulative heat exposure over the course of a school year is associated with a lower level of student learning, and the presence of classroom air conditioning systems nearly wipes out that negative effect, Joshua Goodman, Michael Hurwitz, Jisung Park, and Jonathan Smith show in Heat and Learning (NBER Working Paper No. 24639). Many previous studies have tried to assess the effects of temperature on learning. Students in hotter countries tend to score lower on comparable measures of academic achievement than those in more temperate climates, but there are many differences across countries, other than average temperature, that are difficult to hold constant. In this study, the researchers reviewed the PSAT test scores of 10 million U.S. students from the high school classes of 2001 through 2014, all of whom took the PSAT at least twice. They also collected or generated data on daily temperatures near schools, the penetration rate of air conditioning at schools, and many other demographic, educational, and environmental factors. Comparing a student's score on the test to the same student's score one year later allowed them to isolate the impact of experiencing a hot school year prior to the test. The key finding is that higher temperatures over the course of a school year reduce academic achievement. 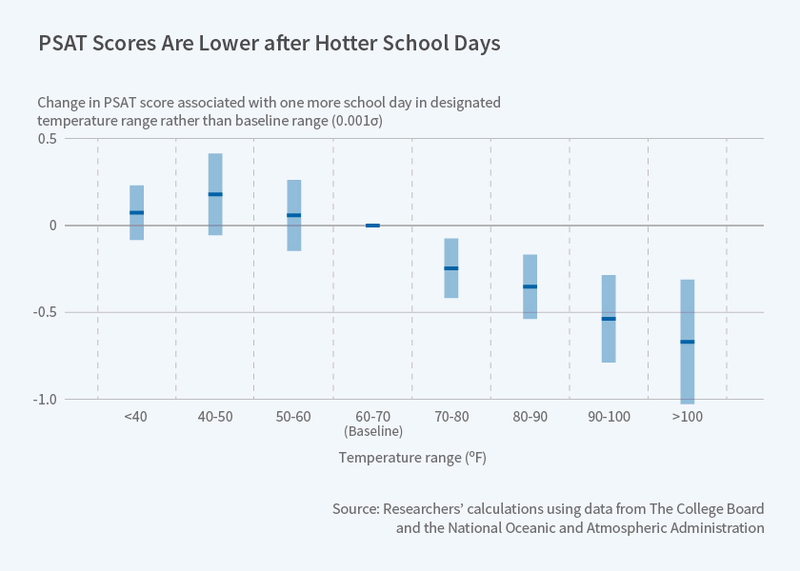 Each additional school day with a temperature in the 90s, rather than the 60s, reduced achievement by one-sixth of a percent of a typical year's gain. If the temperature exceeded 100℉, the adverse effect was even larger. Weekend and summer heat had little impact; the effects were associated only with higher school-day temperatures. The study controls for the correlation of heat, air pollution, and other local economic shocks. Without air conditioning, each 1℉ increase in average school year temperature is associated with a 1 percent decline in the amount learned during the school year. For schools with air conditioning, however, the negative effects virtually disappear. The researchers note that lower-income and minority students are more likely to attend schools that are not air-conditioned. They estimate that, for most regions of the United States, investing in school air conditioning systems leads to sufficiently high income gains for students in the long-term to outweigh the costs of that initial infrastructure investment.